New insights to KAWS’s ideology also reveal themselves in the curation of paintings, which, unique to this body of work, feature a slightly different colour palette – viewers are brought to exalt in rich earthy tones: deep green, burgundy, moss, teal, and pops of neon yellow. Elements of landscapes are abstracted, and figurative features are shroud in washes of the rich tones. 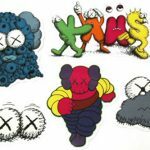 Carrying through the lifespan of KAWS’s work, the signature “X” reveals itself again only to be layered by shadowy foregrounds, establishing the sense of being in a place within the artist’s mind. KAWS also unveiled two new multi-paneled paintings, consuming the viewers by their depth and expansive scale. 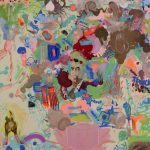 Residing somewhere between installation and painting, these multifaceted works bring a physicality to their subject matter in an activated way. 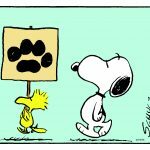 Familiar to the Warholian tradition of repetition and seriality, the audience is asked to consider each panel’s image singularly, or together as a unified whole – yet another symbolic investigation of our culture’s connectivity and disconnectivity. Experiencing GONE offers endless parallels that one can draw between the paintings and bronzes; moments of witnessing and hiding, moments of bravery and resignation, and the subsequent paradox of emotions. 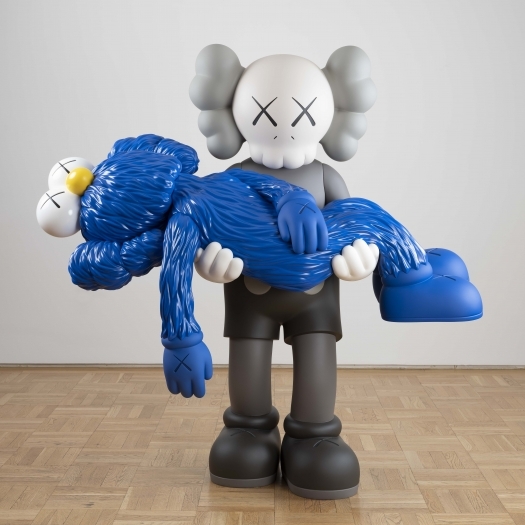 This entry was posted in Art Stuff New York and tagged Kaws, Skarstedt Gallery. Bookmark the permalink.